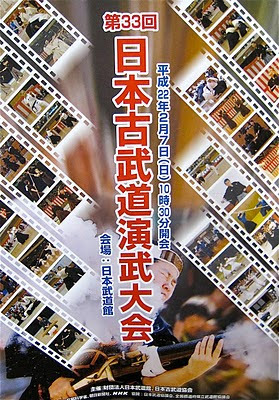 On Sunday, February 7th, I watched the 33rd Annual Japan Kobudo Demonstrations at the Nippon Budokan. There were 35 demonstrations of 35 different kobudo arts from all over Japan. The variety of kobudo impressed me. And yet at the same time, the quietness of the whole event was interesting, as each demo seemed to have this building up of energy and focus leading to an explosively controlled and refined performance. 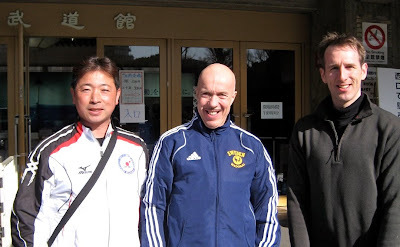 Arakawa Sensei (Shiramizu Karate), Fred Jarbo (Sollefteå Club, Sweden Wadokai) and moi. Wadoryu Jujutsu Renpo (Wadoryu Karate Renmei) demonstration by Otsuka Sensei. International Okinawan Gojuryu Karatedo's Morio Higaonna Sensei's Demonstration.